Journal Reference: Song X and G Zhang. 2018. 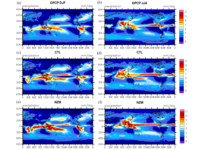 "The Roles of Convection Parameterization in the Formation of Double ITCZ Syndrome in the NCAR CESM: I. Atmospheric Processes." Journal of Advances in Modeling Earth Systems, 10(3), 10.1002/2017MS001191. Figure 1. 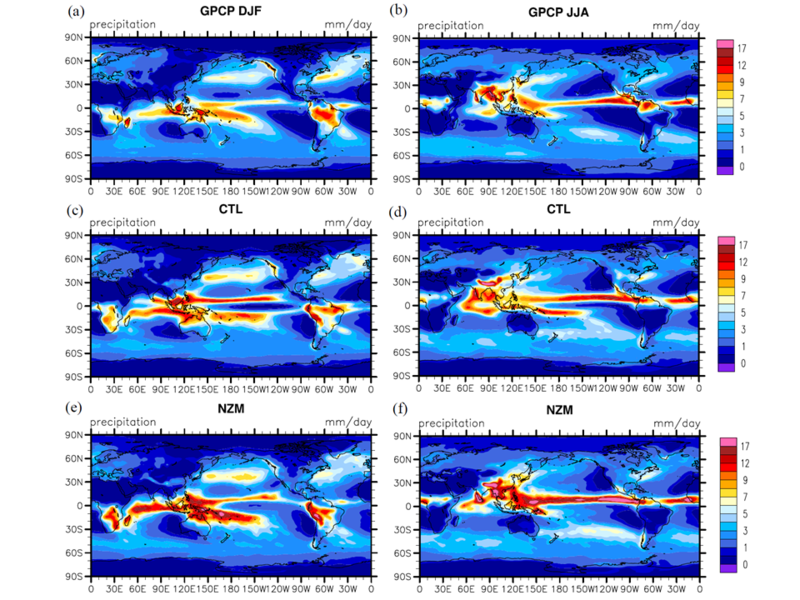 DJF (left column) and JJA (right column) mean precipitation rates (mm day-1) from GPCP observation (1st row), standard CESM1.2.1 simulation (CTL, 2nd row), and CESM1.2.1 simulation with modified Zhang-McFarlane convection scheme (NZM, 3rd row). This study demonstrates for the first time that improvements in convection parameterization can eliminate the double intertropical convergence zone (ITCZ) biases in all seasons, including boreal winter and spring in the NCAR CESM. It corroborates that convection parameterization is the primary contributor to the double ITCZ bias and provides a possible solution to the long-standing double ITCZ problem. The spurious double ITCZ is a long-standing tropical bias in generations of coupled global climate models (GCMs), which limits the abilities of GCMs to simulate and predict climate variability on seasonal and interannual time scales (e.g., MJO and ENSO) and project future climate change. This study demonstrates that convection parameterization is the primary contributor to the double ITCZ bias and improves the understanding of double ITCZ bias, which will facilitate further improvements of convection parameterization and climate models. The role of convection parameterization in the formation of double ITCZ bias in the NCAR CESM1.2.1 is investigated by implementing several improvements that resulted from analyzing the ARM data in previous studies in trigger function, closure assumption, and cloud model of the Zhang-McFarlane (ZM) convection scheme. It is shown that the double ITCZ biases of precipitation, sea surface temperature (SST), and wind stress in the standard CESM1.2.1 are largely eliminated in all seasons by using the modified convection scheme. This study demonstrates for the first time that the modifications of convection scheme can eliminate the double ITCZ biases in all seasons, including boreal winter and spring. Further analysis shows that the elimination of the double ITCZ bias is achieved not by improvements in other possible contributors, such as stratus cloud bias off the west coast of South America and cloud/radiation biases over the Southern Ocean, but by modifying the convection scheme itself. It demonstrates that convection scheme is the primary contributor to the double ITCZ bias in the CESM1.2.1, and provides a possible solution to the long-standing double ITCZ problem. The impact of changes in each core component of convection scheme on the double ITCZ bias in the atmospheric model is identified and further investigated.